The Diocese is responding to the ever changing needs of its parishioners and the communities that it serves. Formed in 1995 from a division of the Diocese of Lake Malawi. We are one of four Anglican Diocese ministering to the people of Malawi, Africa. 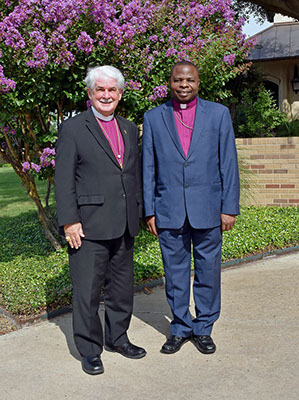 A member of The Church of the Province of Central Africa and world wide Anglican Communion. Companion Diocese with Birmingham, Dallas, Fort Worth. Relationship with SOMA. In November, 2010 the Rt. Rev. Fanuel Emmanuel Magangani was consecrated the 3rd Bishop. The Leonard Kamungu School of Theology is an Anglican Seminary located in the city of Zomba, Malawi. The school provides classes in theology, church history, spirituality, pastoral care, as well as courses in Islam and African Traditional Religion, enabling the student to do the work of pastors as well as evangelising to the communities they will be serving. Life at Leonard Kamungu Theological College centres on the chapel which has daily morning and evening services. In addition to their studies students farm to supply food for their meals. In our diocese we have the order of Sister of St. Mary. Their main duty is to pray for our diocese, the church, nations and to take care of the needy. They have a maize and Irish potato garden, they keep goats, sheep and chickens. They also conduct a business of tailoring which is one way of self support. Fond memories of my mission trip with soma to likoma. All the healing and deliverance we took part in. But God ! How much is it for round trip from Nkhatabay? So pleased to see this!! Thank you for taking care of others. Thanks so much to all for your love and care for others! For sure and we thank and praise God for their brotherly gesture. Congratulations. Praise be to the Almighty for making the partnership a reality. Wonderful. The dental clinic will be great to have. Praise God from whom all blessings flow! Thank you, Mother Miriam for arranging such important deliveries! It made it!!! Praise God! They say you can't love without giving " for the Lord God so loved the world he gave His begotten Son". Testimony of true giving - expecting nothing in return. This is a great work of God’s hand through the partnership with Diocese of Fort Worth with St Lawrence Parish on the background of this good work. Please Holy Trinity Kanjuchi take care of this beautiful house of the Lord. Incredible works of Christ through Christians! Congratulations Bishop and the entire family of Northern Diocese, this is a great achievement and we glorify God for it. A printing press! Praise the Lord! Half down half remaining. We wait for the other half. The the good work continue to the glory of God the Almighty King. Bishop, I request you in the name of God, don't just share the joy, please share the second load to me, I will know where to donate it. Ha ha haaaaaa!!! With God are the impossibles are Possible! Praise God and Christ the Redeemer! You rock!!! All glory be His for ever. Great job so good to see the progress made! A work of love shows evidence of God’s blessing! May He abundantly bless all hands who have touched this project! This is a work of art! Bless the hands who made this place to worship our loving God! A friend in need is a friend indeed.Many thanks to you our Lord Bishop Rt Rev Dr Fanuel Magangani for putting the funds to good use and intended purpose.We are proud of you. Congratulations what does it mean bi-vocation? All blessings to the Sub-deacons. Content is provided by Bishop Magangani and members of the Anglican Diocese of Northern Malawi. Hosted by the Episcopal Diocese of Fort Worth.